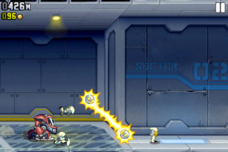 Complete List of Jetpack Joyride Achievements , powerups and Vehicles. Essential Barry Steakfries Guide! Jetpack Joyride is arguably one of the hottest games on iPhone, personally I prefer it to Temple Run. 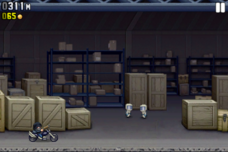 So we've dug through the web to write a guide for Jetpack Joyride on iPhone. In here you can read about the Jetpack Joyride achievements, what to upgrade and other hints tips and secrets to help Barry Steakfries along. The Half-Brick game is madly addictive, so we hope you'll use the Jetpack walkthrough to beat the game and be able to sleep at last! Description: Buy a matching set of clothing. How to get: Purchase any clothes apart from the ones you begin with. Top Hat and Classy Suit to complete two achievements at once. Description: Collect precisely 69 coins. Description: Buy a golden vehicle upgrade. Description: Run into the bottom obstacles 3 times in a row. How to get: Just start a game 3 times doing nothing. Description: Stare at the main shop screen for 2 minutes. How to get: The Stash screen. Description: Open and close the main menu slider 10 times. 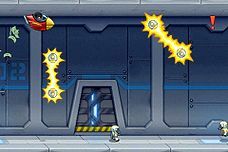 How to get: The little tab with an arrow on the Jetpack Joyride main screen. 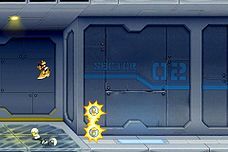 Spice of LifeDescription: One of the first achievements I got in Jetpack Joyride ,use every vehicle in Jetpack to get it. Description: Get Barry Steakfries Flying corpse to collect 20 coins when you die. How to get: Bump into zappers in front of the biggest stack of coins you can find and hope you've got enough game momentum. Description: Travel a total of 50kms in the game. Description: Get to over 2kms. Description: Get unlucky with the final spin a hundred times. Description: Knock over 1000 scientists. How to get: You'll have to use a jetpack that kills the scientists . Description: Spend over 50,000 coins. How to get: You have to reach 5kms in one game. Quite an app achievement! Description:Just go for a pleasant trip using the Rainbow Jetpack and don't collect any coins. Description: Get a score of precisely 200m. How to get: Attempt to hit the third zapper. Description: Buy any 2 jetpacks. How to get: Any one will do. Traditional Jetpack or Rainbow Jetpack to complete two achievements at once. Description: Fly a total of 10kms with the bubble gun jetpack. Description: Get a best distance of over 800m in the teleporter. How to get: Use luck or skill with the Crazy Freaking Teleporter. Description: Get the profit bird twice in one game. Description: Finish all the missions, and start again. Description: Fly over 1km, whilst nattily wearing the top hat, classy suit and traditional jetpack. Description: Fly 2km, without touching any coins, scientists or tokens. 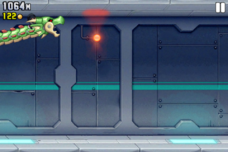 How to get: Try the Super Head Start powerup and stay near the ceiling to avoid scientists. Description: Save an action shot to your camera roll. How to get: At the end of each game there is a little photo that says TAP TO VIEW. Tap it and tap the small disk icon to save it. Description: Ride Mr Cuddles while using the Fruit Jetpack. Phew, there's your complete list to all the achievements of Jetpack Joyride, good luck getting them all and remember to take time out to eat and sleep! There are 6 power-ups to collect in Jetpack and there 2 collectibles. A nimble robot that Barry SteakFries rides in , it makes it is probably Jetpack's best vehicle for collecting coins. CRAZY FREAKY TELEPORTER - Definitely crazy as it teleports all over the place, time your teleports right though and you can avoid collissions with rockets and zappers. A reference to another great iPhone Half Brick Game: Monster Dash. Barry is stuck to the floor with the Bad as Hog but can make pretty big wheely jumps. 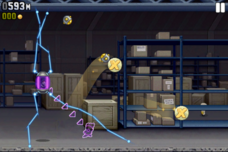 This Jetpack Joyride powerup is Good for getting places fast. The 2 collectibles are coins and spin tokens; the coins are used to buy goodies from the stash (such as different clothes for Barry Steakfries; new Jetpacks like the BubbleGun; Rainbow Jetpack and traditional Jetpack; new Jetpack Joyride Vehicles : Gold Mr. Cuddles etc) . 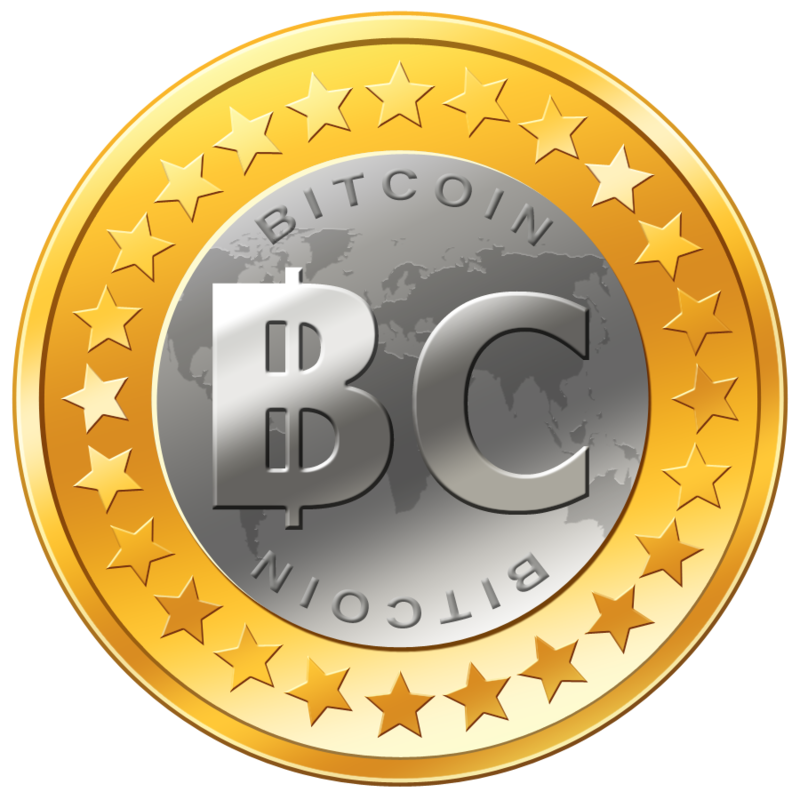 Spin tokens are used on the slot machine at Games End or can be swapped for fifty coins each. Nice post! For me, Profit Bird is the best, not the worst vehicle. It's the easiest to operate, you just need to tap more :) I also love Mr. Cuddles and like Stomper. I don't like the hog, in many cases you just fall to the obstacle and have no influence on that. Teleporter is interesting, after some practise it's pretty useful, but hardly great. Gravity suit is my second least favourite. I think that Profit Bird is a reference to Tiny Wings, not Angry Birds. What do you think? The list is uncomplete, your missing 4 achivements more, 4 of the game center. Thanks for the tip off Anonymous. We haven't really tried the game much on game center, what have we missed? Guys, there are 4 more achievements on Game Center, but we are unable to get them now. They include features which are going to be released within April's update. Thanks for the input WorldIdol, you sound like a person who knows their games. Gametrender always welcomes input form great gamers. That's brilliant , I'll be updating soon to check out all the new gadgets-I'll run a Gametrender article soon about the update after I've uncovered the secrets that Halfbrick has hopefully added for us to find. THANK YOU lovely anonymous person this achievement has been driving me mad! THANK YOU ANONYMOUS FOR OTHER WAY IN!I'VE BEEN TRYING EVER SINCE I GOT THE GAME!!!!!!!!!!!!!!!!!!!!!!!!!!!!!!!!!!!!!!!!!!!! And the "Walkies" archievement????? It makes me maaaad! Really dont know how can i get this! @Marcus........just equip the "Flash" gadget (which is a robot dog) and travel a total of 10,000m with it. This is walkies achievement. Achievement; rejected = fly past token gift...? What is the token gift? one acheivment that bugs me is that one that says stare at main stash screen for 2 minutes. I did that and got nothing .-. I downloaded the game after its latest update and can no longer get the rainbow jetpack. :/ No achievement hippy for me. Also with the latest update to get the spice of life you need to use the wave rider. Congrats on such a amazing achievements, I'm about to get some of them.